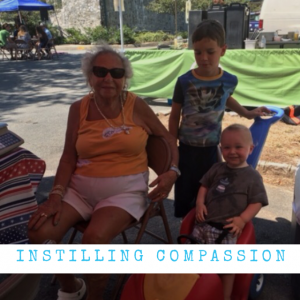 Over the years I’ve had many parents ask, “how do I raise a child to have compassion for others?” Possessing one of the founding bricks of strong character, compassion, is not attained on a whim. Some are born with compassionate hearts, while most are born innately selfish; that’s just the reality of it. As parents and loved ones we provide learning opportunities to strengthen our young people’s character. They maintain a strength in their outlook and choices in life when they possess compassion. But how do we teach our young people to be compassionate? Lack of compassion can exist when we do not expose ourselves to those who differ from us. If we lack a desire to care it can reinforce a belief that we live in a world that may exhibit no sign of needs, hurting or loss. To reside in such a reality will offer no opportunity for compassion. When focus is solely on them and identity is validated by materialistic objects (cell phone, degree, job, clothes, etc.) they are being set up for a one dimensional view of life. Holy moly is that empty and meaningless! In the past few months I have watched my 97 year old grandmother’s health begin to deteriorate. What breaks my heart is looking in her eyes and feeling her frustration at what no longer is. Much of her independence has been taken from her. It stinks. Simple tasks such as putting on her shoes, dressing herself or being able to hear a full conversation are no longer realities. She is now dependent upon her children and grandchildren. She walks slow, talks slow and fumbles. It would be convenient to be frustrated with her, but it would not be fair. She is owed compassion. She deserves to have be treated with respect, patience and love. This past weekend, as I held her hand in mine I could only think of what her hands had been through in the past 97 years. What have they seen? Who have they loved, lost, cared for? I have the choice to observe her as an old, frail woman or as my grandmother who is feisty, stubborn and adores her grandchildren. She simply wants respect, love and to be heard. But isn’t that all of us, really? No one wants to be treated any other way than they deserve to be, and that my friend, is compassion. Compassion is not an attribute the majority possess. But it is possible to instill the building blocks of compassion in our young people’s hearts. It takes times, consistency and patience. So where do we go from here? Reflection: Share with your kids stories about the hardships and resiliency of family members (aunts, great uncles, great great grandparents, etc.). Empower them not only with their family history, but provide insight into challenges and struggles that gets mental wheels spinning. This puts them outside of themselves and humanizes their loved ones in a great way. Pay it forward: Find opportunities with your kids (this can be a lot of fun) to do anonymous acts of kindness to those who could use a boost of goodness. There’s no applause or prize involved in the giving and that’s another life lesson. When we allow our minds to become wired to seek out ways to enhance someone else’s life there is so much potential to expand the giver’s heart and mind. Serious awesomeness! Snail mail: Does the term even register anymore? Oy! I said it, snail mail. Texting and snap chat stories are not the proper platform for thank you’s and how are you’s. Sorry. No go. Every other month have your young person write a note (it can seriously be 1.5 paragraphs) just saying hi or asking how they are to a loved one. Taking time to think, reflect and actually formulate a few sentences about someone else…priceless. Lessons without a text book. Boom! Manners: Without gratitude it’s difficulty to possess compassion. Teach your peeps to say thank you, please, yes and no thank you….When we realize we are not owed what we think we are and to be appreciative of what we should be it can tweak your perception of others. Compassion is a beautiful thing. I have worked with hundreds upon hundreds of teens over the years. It takes a lot to knock my socks off these days. But I will tell you when my paths cross with a compassionate young person I love to sit, chat and soak in a little of the passionate heart they possess. It’s sheer awesomeness! These are kids who perceive needs not clothing labels and who listen with their hearts not their ears. It’s a beautiful thing. Strive for compassion. It does not manifest itself over night, but with time and patience it can take shape. Just remember, as parents and loved ones we set the example. There is little weight in our words if we fail to exude our own teachings. How are you living? What areas can be improved? Always challenge yourself, strive for growth and know that your steps can be a beautiful example for the next generation.That’s a great thing! Wishing you an awesome week! Peace, love & goodness! PreviousPrevious post:Cyber Safety: Know What Apps Pose Greatest Risk For TeensNextNext post:Work Ethic: How Do We Instill It In Our Kids?